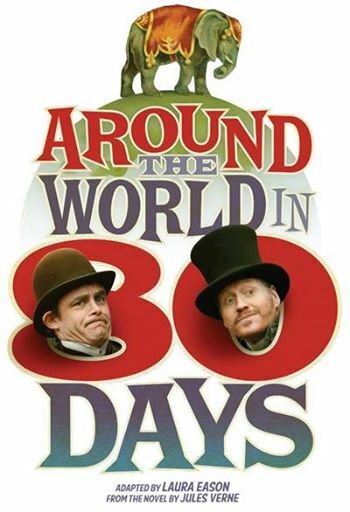 Around The World In 80 Days (Royal Exchange Theatre, Manchester) is a brilliant adaptation of Jules Verne’s classic novel, expertly pitched to appeal to the widest possible audience. I can’t remember when I last laughed so hard (and so often) at a theatrical presentation. Of course, any production of this story is going to stand or fall on the quality of its Passepartout and here, he’s played by Michael Hugo, who clowns (and occasionally improvises) his way through a breathless series of set-pieces, whilst maintaining an assured partnership with Andrew Pollard’s stiff-upper-lipped Phileas Fogg. Though undoubtedly the star here, Hugo is only the jewel in a supremely talented cast. Six other actors take on all the remaining roles, which averages out at around twenty characters apiece! Between them they take on accents, characters and at one point even submit some breathtaking gymnastics. The constantly changing locations are achieved with a minimum of fuss and the use of some everyday objects – in one scene a (surprisingly convincing) Indian elephant is expertly conjured with the use of a grey raincoat and some sound effects. And it doesn’t stop there. At various points we share the experience of travelling by train, ocean liner and ice sledge and it really feels like we’re doing it! Throughout proceedings, Hugo maintains a fabulous rapport with the audience, at one point even involving younger members to help him to evoke the feel of a ship at sea. A scene where he channels his inner Jackie Chan to offer some kung-fu style choreography was a particular delight. At the play’s conclusion the applause was absolutely ecstatic and little wonder, as this is a production that seems intent on redefining the word ‘entertainment.’ If you see only one play this summer, I urge you not to miss this. It really is THAT good. Those of you with young children can confidently take them along in the certain knowledge that they won’t be bored for a moment.